Front Street Shipyard in Belfast, Maine, was home to ATLANTIDE, the 122-foot commuter yacht, during the winter and spring of 2012 to 2013. ATLANTIDE’s new owners purchased her in Palma in 2012, and transported her on Dockwise to the United States, where she arrived in November 2013. Prior to ATLANTIDE’s purchase, a survey produced a list of necessary repairs that the owners have decided to address over the course of multiple years. The initial upgrades and repairs to ATLANTIDE were carried out at Front Street Shipyard. ATLANTIDE’s last major refit was 15 years ago, putting her overdue for many upgrades. Once our team of systems technicians and carpenters began work on ATLANTIDE, they uncovered more issues than the survey had initially identified. With her owners committed to her future, ATLANTIDE underwent months of care and maintenance inside the shop. Because of her extensive exterior teak, much of ATLANTIDE’s exterior varnish was stripped and renewed, while several other areas were built up with multiple fresh coats of varnish. She arrived in Maine without working shorepower converters, so we performed several months of work with creative lighting and electrical hookups while the replacements parts were on order. ATLANTIDE’s owners requested a new radar system, so Front Street Shipyard’s electronics experts installed a Furuno IZ touch and new cameras. They reworked the pilothouse dash area and installed elegant new brass plates engraved for all the switching. One of ATLANTIDE’s generators, the Northern Lights, was completely rebuilt. The difficult-to-access black water pumps were removed and replaced. The mechanical team tore down the yacht’s 8-cylinder Gardiner engines and shipped the parts back to England where Gardiner’s experts rebuilt them. 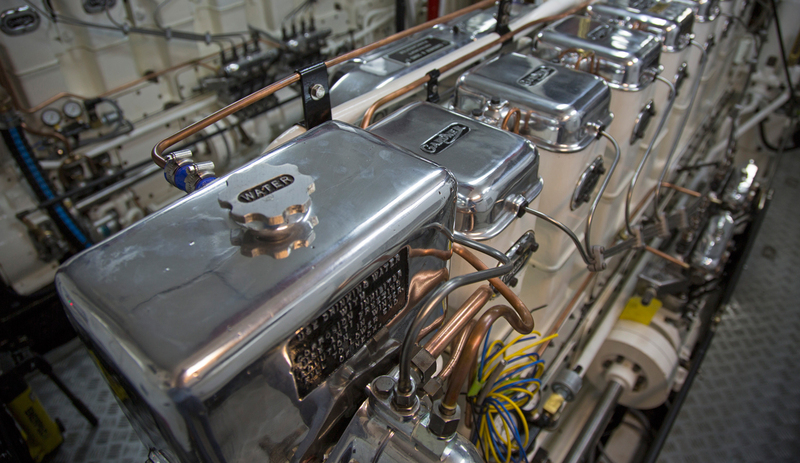 While the engines were in England, Front Street Shipyard’s crew rebuilt the exhaust system, checked all the shaft bearings, replaced and rewired the engine intake and exhaust fans, and installed a Reverso oil-change system. The new transformers and converters arrived in March and were wired into the 400-volt 50-cycle boat system. ATLANTIDE was relaunched in June 2013 at Front Street Shipyard.